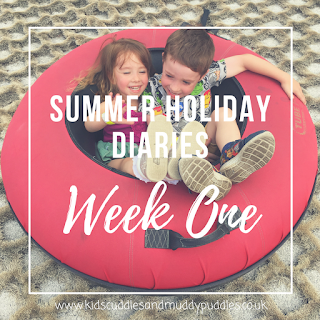 Kids, Cuddles and Muddy Puddles: Summer Holiday Diaries: Week 1 - Birthdays, Bowling and Building Lego! Summer Holiday Diaries: Week 1 - Birthdays, Bowling and Building Lego! I've been really looking forward to the end of term and the summer holidays this year. I think it's because this is the first year I haven't had my son as my sidekick in the week because he started school last September. So July signaled the end of his year in Reception, and a much needed recharge for him (and me!). As I am a teacher, I too am lucky to be able to spend the whole 6 weeks with my kids. I am hoping to enjoy a summer on a shoestring, spending as little money as possible but still having fun together. Here's how our first week went! I took the kids to the library today to enroll my son in the free Summer Reading Challenge. He was excited to get his starter pack and was proud to write his name on the challenge wall himself. I must remember to take a photo next time we go! We chose 6 or 7 books, including one on Lego and Firefighters which he could read by himself. Then it was off to Tesco to get some snacks for a pre-birthday playdate the following day. The kids had a sleepover with their grandparents that night so me and my husband could catch up with friends over Thai food and dancing that evening! A photo from the grandparents! I went to collect the children in the morning so we could go watch shopping for my little boy's 5th birthday present. He had told us he wanted a watch so Nanny and Granddad came along to buy one for him. He chose a blue superhero watch that lights up! Next challenge... teach him to tell the time! The kids totally fleeced their Nan as she let them choose a magazine each to keep them entertained while we grabbed some lunch! They're so expensive aren't they?! And I don't know about your children, but the magazine itself often gets forgotten about after all the freebies are taken off! To be fair to my daughter (2 years 8 months), she has played with her Peppa Pig pizza cutting set every day since! We visited our second free library event of the summer on Monday - a magic show! This kids were enthralled, but my friend and I were a little bored of waiting for this magician to actually do any tricks! Luckily, the kids were kept entertained by the old school "broken magic wand" and the "growing handkerchief" routines and the obvious charm of the magician! It gave us an hour of peace for free so I can't complain really! We came home for lunch and spent the afternoon playing with aquabeads and some magic sand that my son had received as a birthday gift the day before. Then it was time to go his last Rugbytots session. He's been going since he was 3 and a half but we decided that it's time for a little break, and maybe we'll try something new in the Autumn term. Here's S with some of his team. Tuesday morning was spent at our local playgroup which turns into a community coffee morning during the school holidays. There were still toys out for the kids to play with, and a craft table too. A mug of tea and a slice of cake cost me £1 and the kids had free juice and biscuits! My son really enjoyed being back there - I used to take him as a toddler right up until he started school. We spent the rest of the afternoon playing at home. My two have become really good friends just lately, playing nicely together and sharing toys and ideas. Will it last the whole 6 weeks?! Let's hope the novelty of being at home together doesn't wear off too soon... Here's a cute little video clip I took of them dancing together today before they saw me! I took them to explore our foundling Forest School on the way out, where they had a go at den building and finding their way through the maze of bushes! We left so late, it was only fair that we all had Happy Meals for a late lunch / early tea on the way home! A cheap end to an otherwise cost-free day! Today was a special day - Our son's 5th birthday! My husband had the next few days off work so we made a special day of it. The morning was spent opening cards and gifts and playing with new toys. Then it was off for a game of bowling, which was great fun as always! A family ticket booked online was quite good value at about £28 but I've since seen lots of summer holiday deals so it's worth checking out your local bowling alley this summer. My hubby had snuck out to make a phone call earlier on, and came back in to say he had a surprise! After our game, he took us all to the local dry ski slope where he'd booked us in for an hour of tubing! (Again, a family ticket didn't break the bank at about £20.) My son and I have been twice for parties recently, but this was a first for my hubby and daughter! We all had a brilliant time, even though it was almost 30 degrees and we were melting! Thankfully the staff turned on the water spray which cooled us down a bit... and made the tubes go faster! Double bonus! After a hectic day, we decided to go for a nice walk with a family friend and her 5 lovely children. We walked from Leek up the track all the way to one of our favorite places, Rudyard Lake. It took a good hour to get there, where we treated everyone to ice creams and a sit down. The walk back was a little slower - there were a few weary legs by this point and our daughter managed to hitch a ride on the bottom of our friend's baby's pushchair! Just under 8 miles we walked that day...7 kids with no accidents, until we were 2 minutes from my friend's house on the way back! Poor little man stacked it and grazed his knee pretty bad! A cold flannel, some fresh squash, a cuddle and some sweets later and he was all smiles again! Both children were asleep within minutes when we got into the car to come home! Can you believe I forgot to take any photos that day? Gutted! Today was party day! The birthday boy had chosen a swimming party so this is what we did! Our party included a 1 hour swim in the pool with slides, splash features and water flume, a hot lunch with juice and ice cream in the pirate themed party room, then 45 minutes in the soft play area afterwards! Followed by party bags which were also included. The staff even lit the candle on the cake, lead the happy birthday song then cut up and bagged the cake! All the parents were treated to a tea or coffee to help recover from the swim! I know parties can be very expensive. However, I didn't have the stress of hosting, preparing food, entertaining children or clearing up and to be honest, a party at home with the whole class, catering and party bags would probably have ended up costing the same, if not more! All the children had a fantastic time. It was so nice to see how they interacted outside of school, and to see how much their friendships have grown during their first year together! Even some of the parents commented on how much they enjoyed it, so I'm pleased we went for this choice, even if it didn't fit into our frugal summer ideal! Later that evening, my parents came up to visit the birthday boy and spend the rest of the night with us. They joined in with present opening, Lego building and birthday cake eating before leaving to check into their hotel for the night. The kids were over the moon to spend some time with their grandparents - we live about 130 miles apart so we don't get to visit each other too often. I spent the morning helping my son with his new Lego set. I didn't really do much other than help him follow the instructions carefully so he didn't miss any steps. He was so proud of himself when he finally completed his model, and it has pride of place on a new Lego shelf in his bedroom! My parents popped back in for a few hours before heading off on their long trip home, and my hubby took us out for lunch to finish off the weekend! The day ended with a bit of old toy decluttering from our son's room to make way for new presents, and a bath and early bedtime for the children! I have managed to sell a few old toys online already, which is a great way to add a few quid to our summer fund! Wow! What a busy first week of the summer holidays but thoroughly enjoyable! Next week's mission is to be as cost-effective as possible. I'll be looking out for free events and activities to get involved in, and hopefully we'll have lots of fun. I'll also be remembering to take a few more photos, to add to my diary posts to look back on in the future! This week I have found a lot of joy in watching the friendship develop between my children. Since S has been at school, R has lost her little playmate - so to have him back for a whole week so far has been a total blessing to her! Yes, they do argue at times but that's a normal part of being siblings, but I have watched them closely this week. They play together beautifully, listening to each others ideas and taking turns. They have giggled and schemed together, sang and danced together, hugged and held hands and genuinely enjoyed being together. 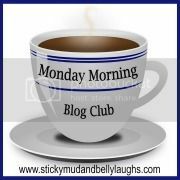 Check out #MySundayPhoto: Week 7 to see where I managed to capture some of these special moments. Long may it continue! What a great idea! Great resource for when your stuck for ideas on how to entertain little ones over the holidays!